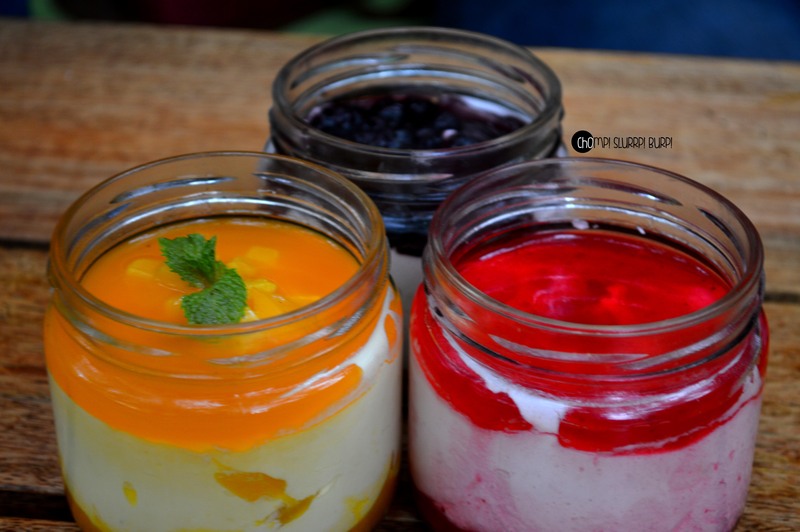 Summer Savories at Unplugged Courtyard - CHOMP! SLURRP! BURP! 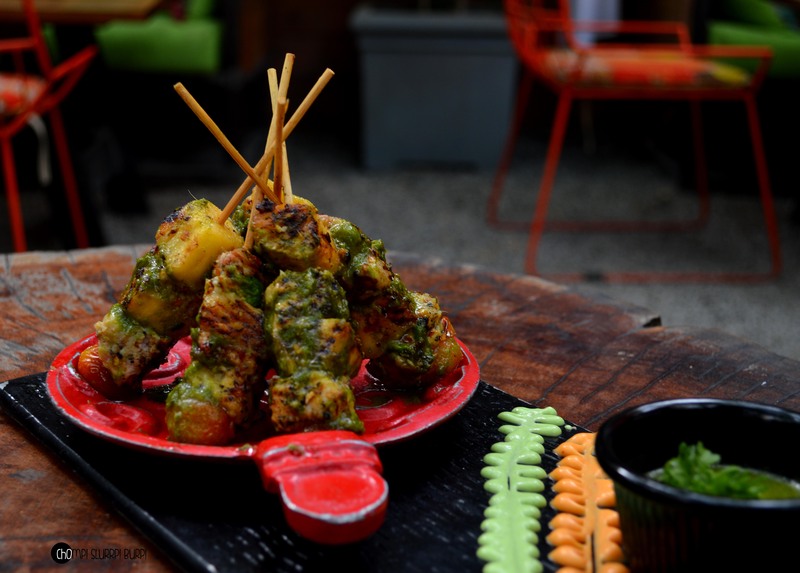 Summer menus are the hot favorites during this Delhi summer and Unplugged Courtyard brings to you a beautifully done menu for summer. 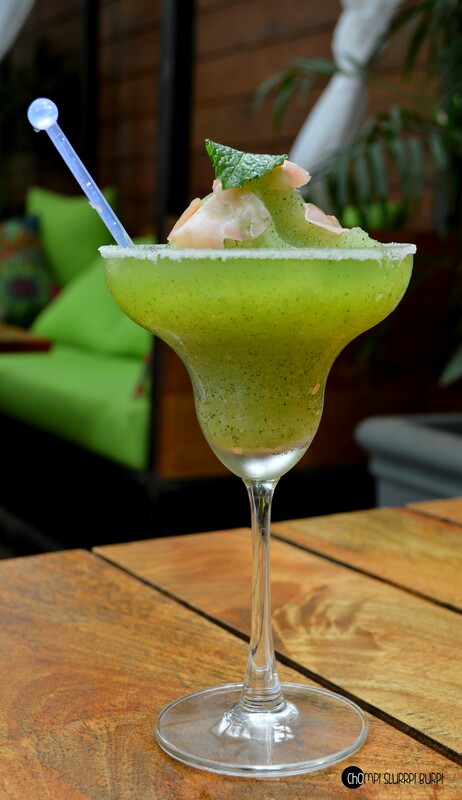 Cold soups, salads, refreshing snackers and frozen drinks are sure to dazzle you cool you off. You can choose to sit inside with plush leather couches, saddles and dim lighting or experience the real magic outside in their beautifully done courtyard. Lush greens, fair lights adorned globes, gravel and bright pops of oranges and chartreuse on the furniture – feet tapping music and water sprinklers so you survive the heat. 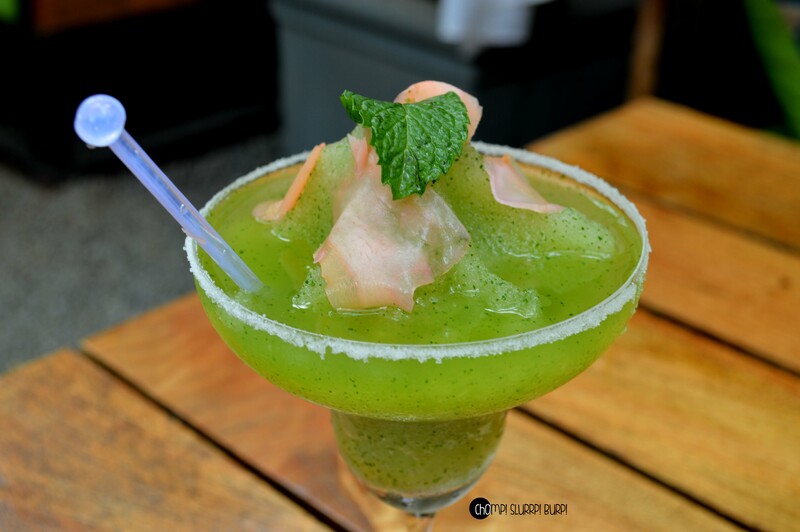 We started off with drinks – Frozen Island – Vodka, mint leaves, a hint of ginger, served frozen proved to be the perfect respite. The peach and ginger sunny was a little too much on the sweeter side but decent otherwise. 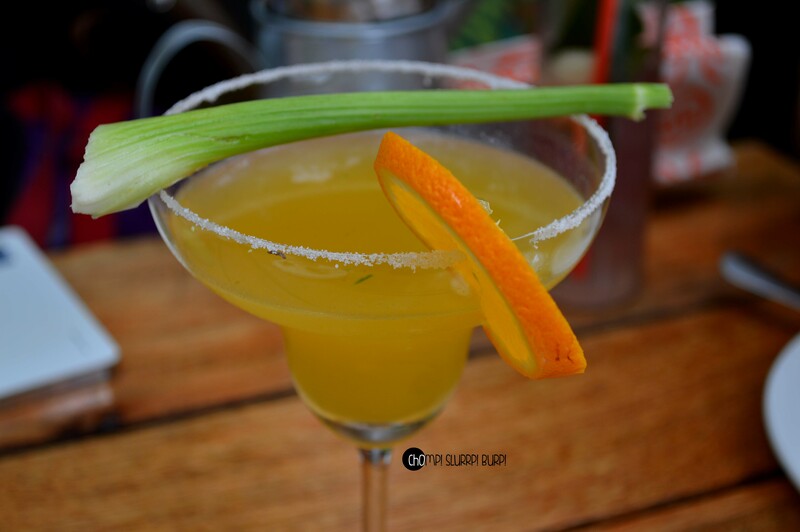 We also tried some Orange and celery margarita which was delicious and also the cucumber gimlet, again, very refreshing. 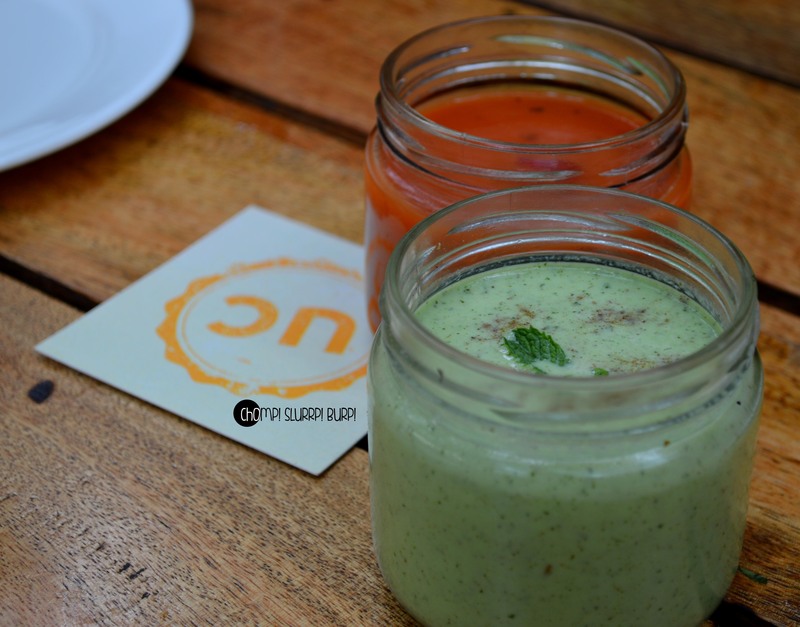 Moving on to the soups – we had the cold cucumber soup and the carrot and plum tomato soup. Both the soups turned out to be slight let downs – the former being high on salt and the latter a dispassionate tomato concoction. The cold salads however were all too impressive. 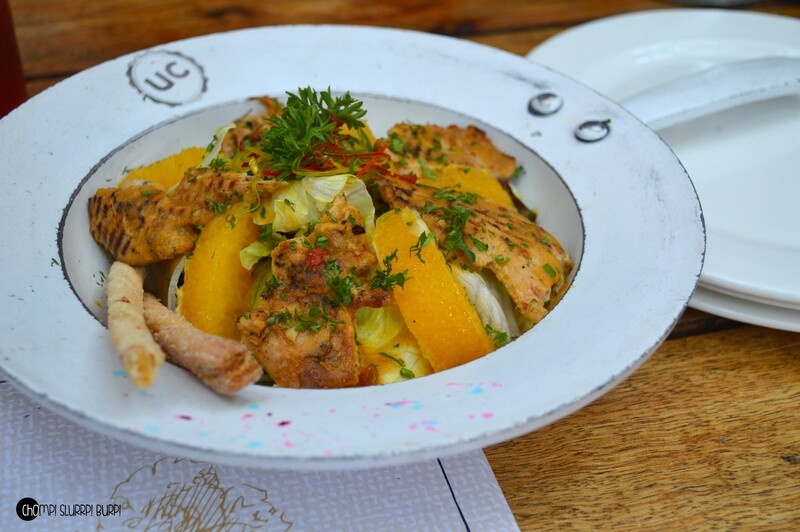 We started off with the Orange chicken salad – chicken strips marinated with orange juice and grilled were very tender and juicy, tossed with fresh orange slices, lettuce and bread sticks – the preparation was simply delectable. 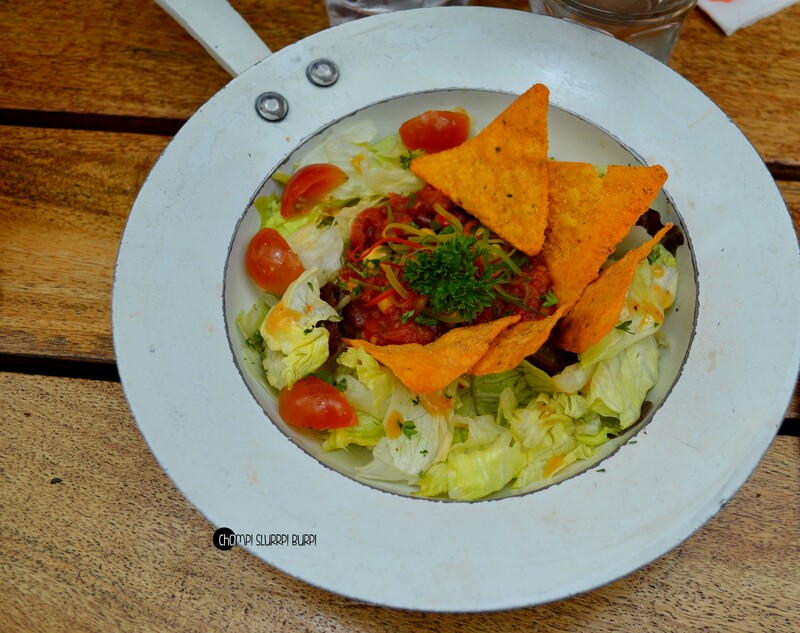 The Mexican salad with tortilla – lettuce, beans, sweet corn tossed together and served with tortilla chips. Again a very delish preparation. 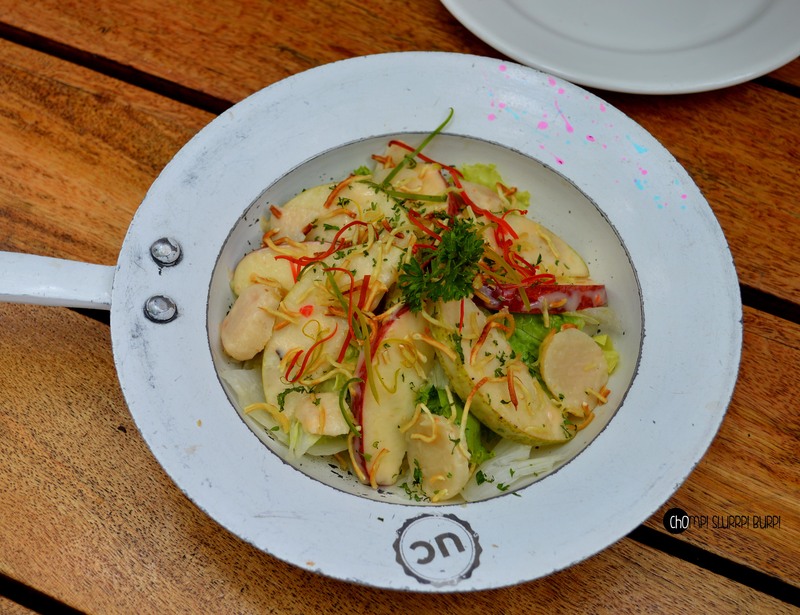 The Summer Crunch salad – pears, apples and lettuce topped with crunchy noodles. The starters – Bocconchini cheese and plum tomato crostini – Crostini topped with cheery tomatoes, a cube of plum and cheese – the tomatoes rather over powered all the other flavors and the slight tinge of plum lost its zest. Chicken pop pineapple and parsley sauce – beautifully stacked together – the chicken was very well marinated to a melt-in-your-mouth perfection. The pineapple cubes and parsley sauce complimented the juicy wonders very well. 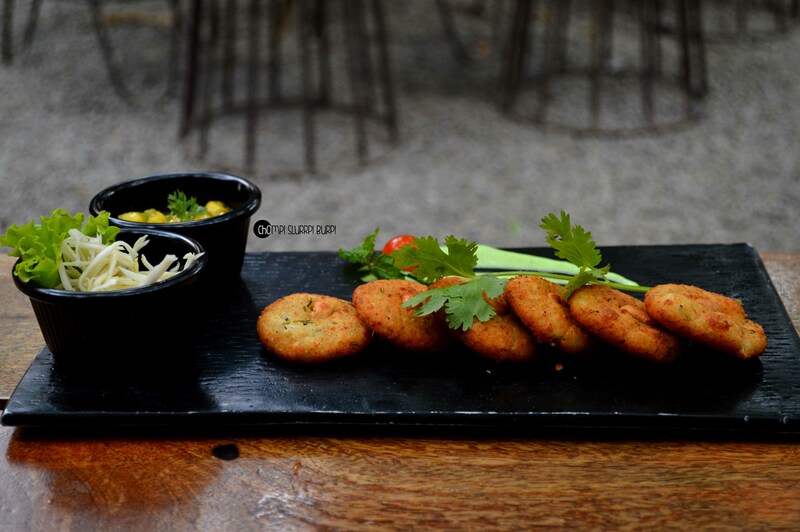 Cottage cheese cake with pineapple relish – soft cottage cheese dumplings, crispy fried and topped with a cashew nut. The dumplings were really delicious topped with the pineapple dip. And lastly – the Greek salad pizza . This was undoubtedly the star of the meal – a cold pizza with toothsome sauce, garden fresh vegetables and feta cheese. 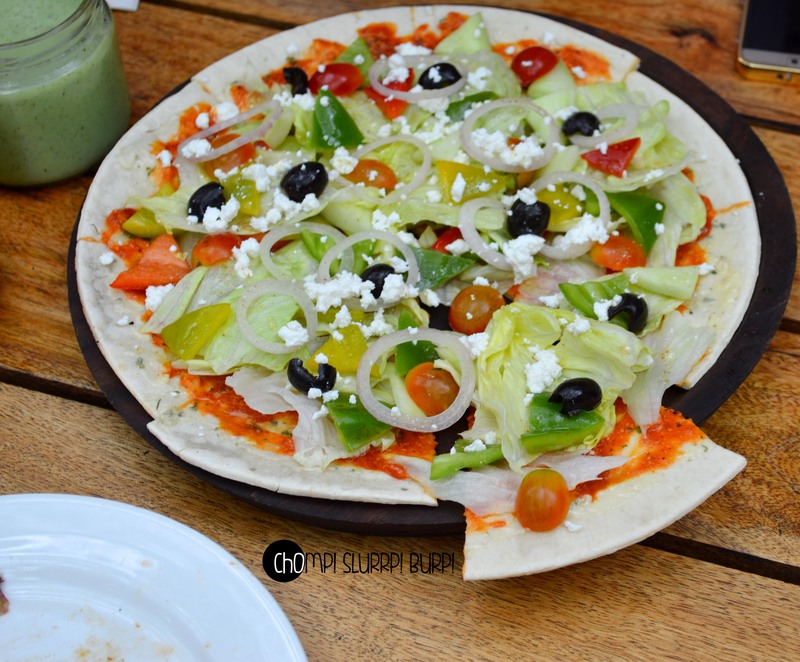 This pizza is not just apt for summers but also makes for a very healthy alternate. 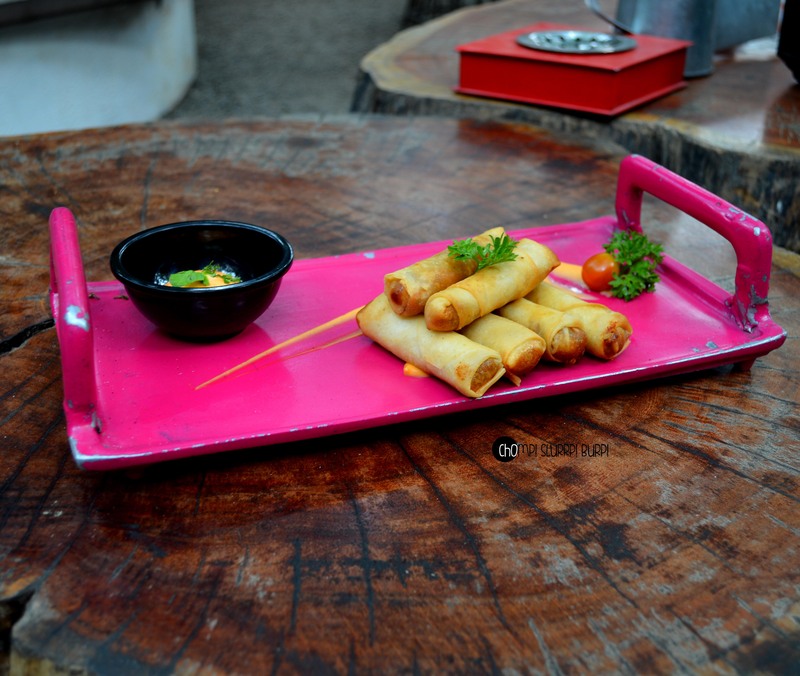 We also ordered some tid-bits from their regular menu – the stuffed enchiladas came wrapped in spring roll sheets, stuffed with beans and cheese. The maggi dimsums were not quite upto my liking but the chilly chicken dimsums were pretty good. 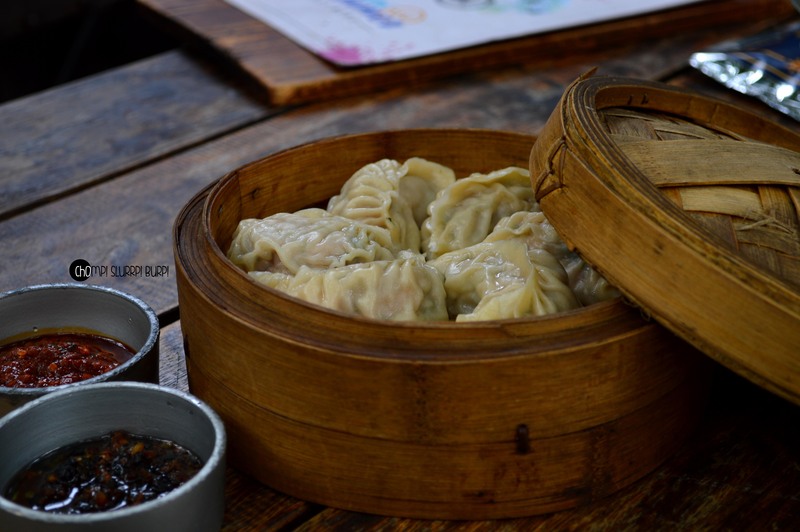 I have most definitely had better dimsums but the dips that came along side made this lot extra-ordinary. The Aam Aadmi chicken arrives impressively, clad at the end of a danda with a bicycle ring tringing as it makes its way towards you. 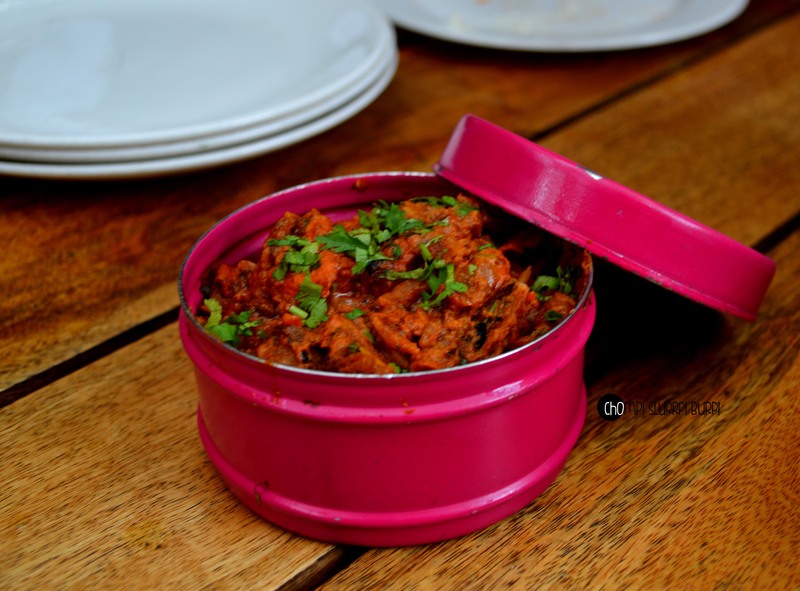 Wrapped in a red cloth and enclosed in a bright fuschia dabba – this chicken appetizer clad with desi masalas is very palatable. 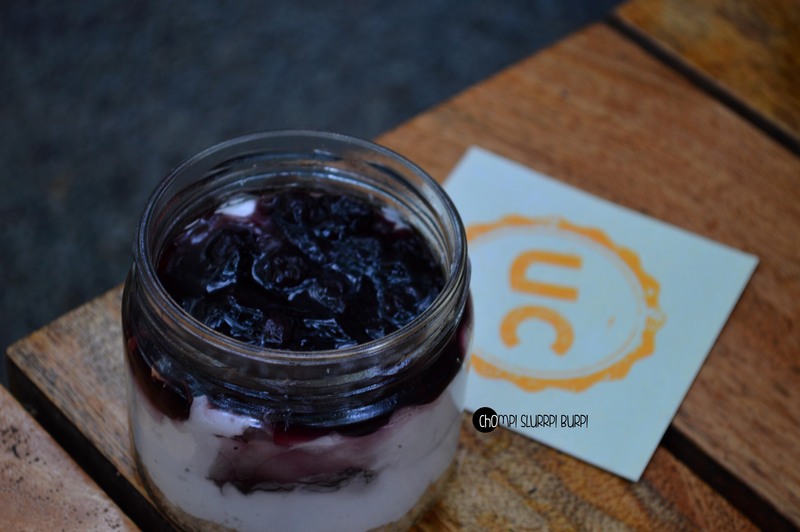 Out of all the desserts – I liked the blue berry cheese cake the best – the biscuit crumb crust, cheesy cream and topped with berries served in a jar. 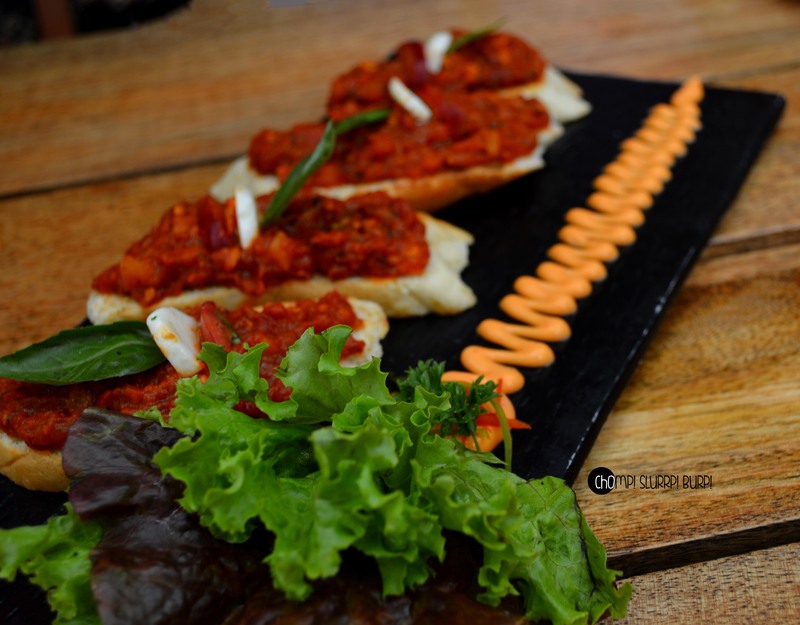 So, head to Unplugged for some refreshing cocktails, cold salads and definitely the Greek Salad Pizza.